Saturday morning I went to the same bagel place I went to on Friday, this time opting for the everything bagel and not the wild berry. I did almost nothing until I left Mark’s place at 3:45 PM. I went to Primanti Bros. for dinner and I was not disappointed. I went to the original restaurant that can be found on 18th street. I parked on Smallman Street and they charge $5 to park there, no matter if it’s 30 minutes or 12 hours, same price. 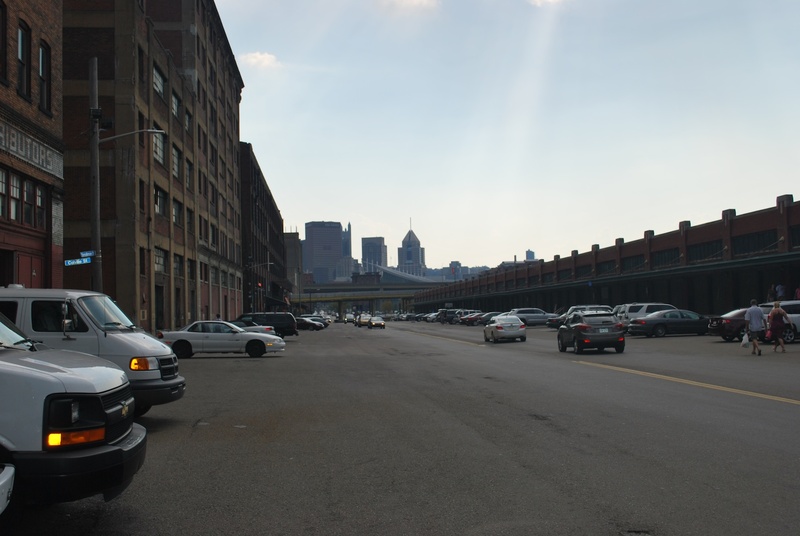 This is looking southwest on Smallman Street. 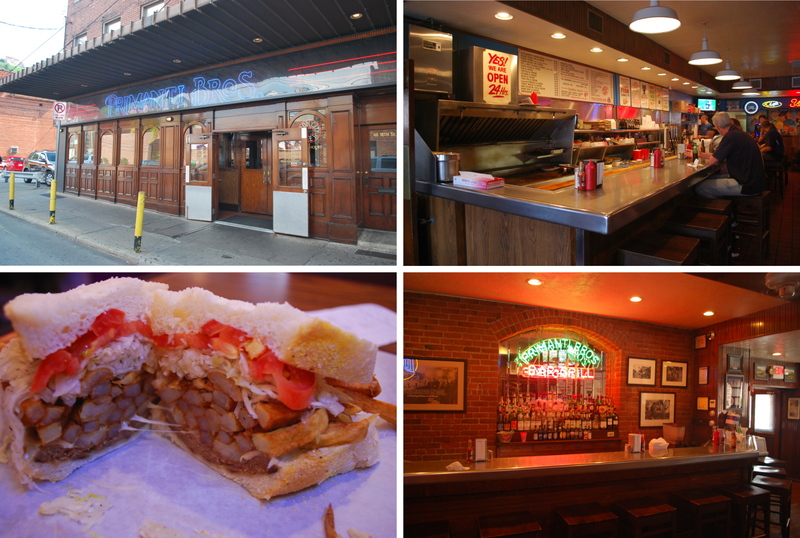 The four parter below details Primanti Bros. and it goes clockwise from top left. 1) The exterior of Primanti Bros. It’s in the “strip district” but I saw zero strippers (which is a good thing). 2) The interior of the restaurant right when you walk in. This location is open 24 hours as the sign in the upper left says. 3) The bar and seating area if you turn left when you walk in. 4) My dinner: A “Pitts-burgher cheese steak” sandwich. All sandwiches come topped with with french fries, cole slaw and tomatoes. I forgot to ask for onions and it even says that they’re optional on the menu right next to where they detail what the sandwiches are topped with. I knew that the sandwiches came with french fries, but they pack a lot more on there than I was expecting. Nicely done. 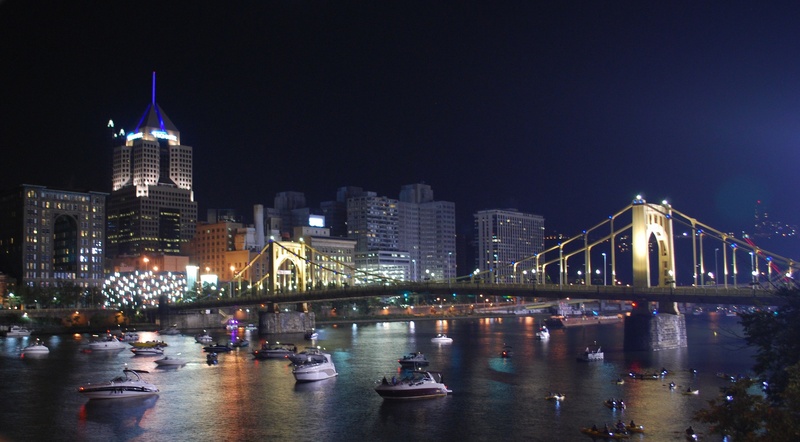 After eating I drove the mile and a quarter to the parking garage on 6th street and started walking towards PNC park. I usually only get one game number photo from outside of a stadium but I made an exception on Saturday for game photo number 125. 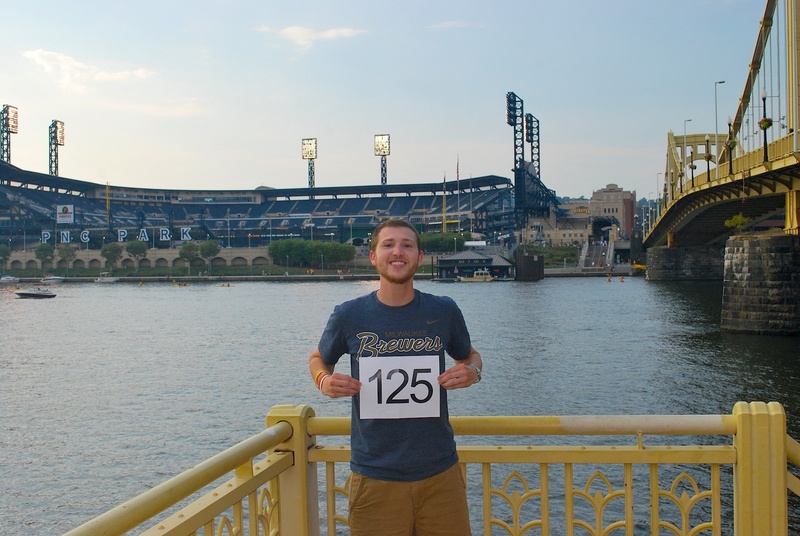 I walked across the Roberto Clemente Bridge and picked up my ticket from will call. 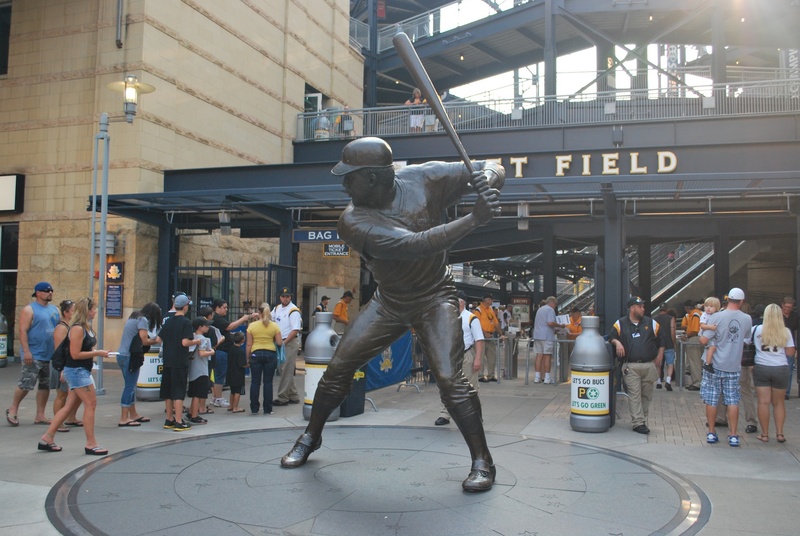 On the way back towards the river I took a picture of the Willie Stargell statue they have along the third base side of the park. Stargell played for the Pirates from 1962-1982, helped them win two World Series and was a 7-time All-Star. In the left field corner they have a Roberto Clemente statue, which is fitting since the Roberto Clemente Bridge is just beyond it. 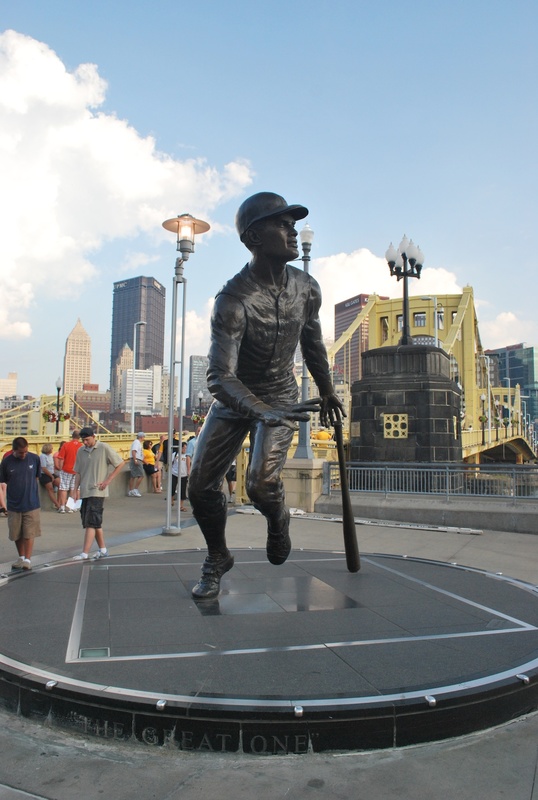 Clemente also played for the Pirates his entire career, from 1955-1972. He finished his career with exactly 3,000 hits. He would’ve amassed more but following the 1972 season he died in a tragic plane crash while trying to deliver relief packages to the survivors of an earthquake in Nicaragua. 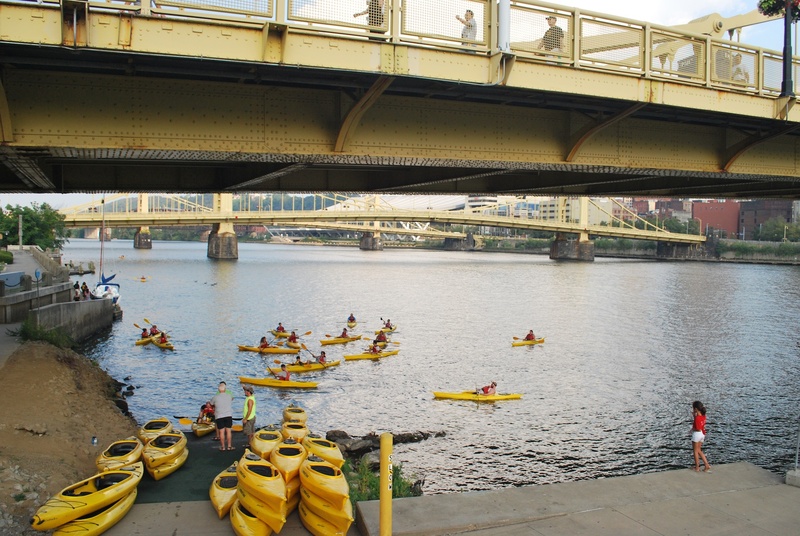 I forgot how much it was but you could rent kayaks for a given amount of time. Pretty cool. 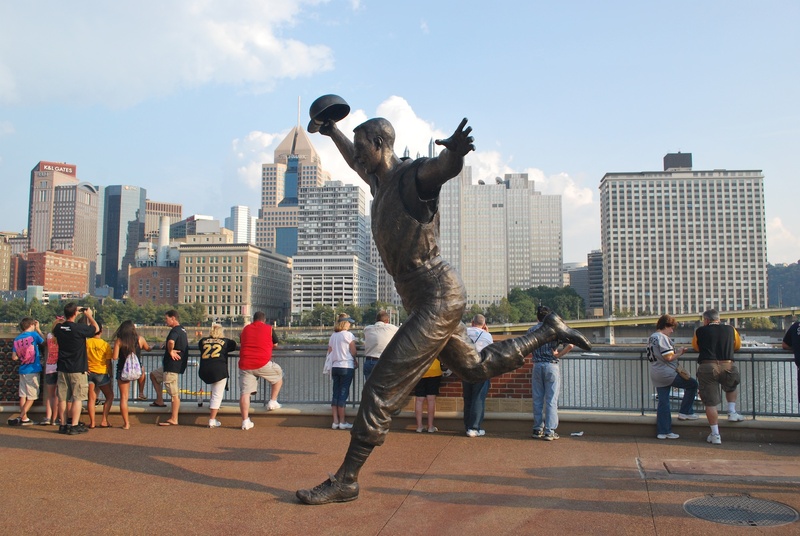 I made my way towards the right field corner and when I came up the stairs I was greeted by this statue of Bill Mazeroski. 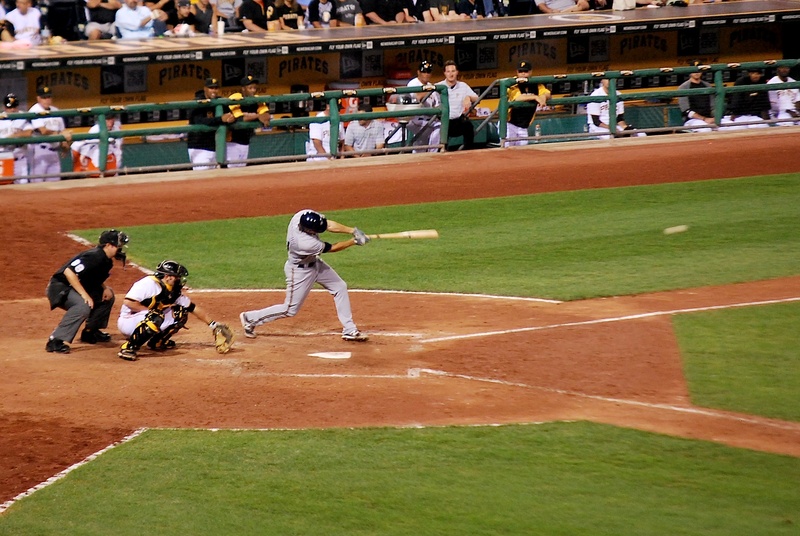 Mazeroski hit the only walk-off home run in the deciding 7th game of a World Series. 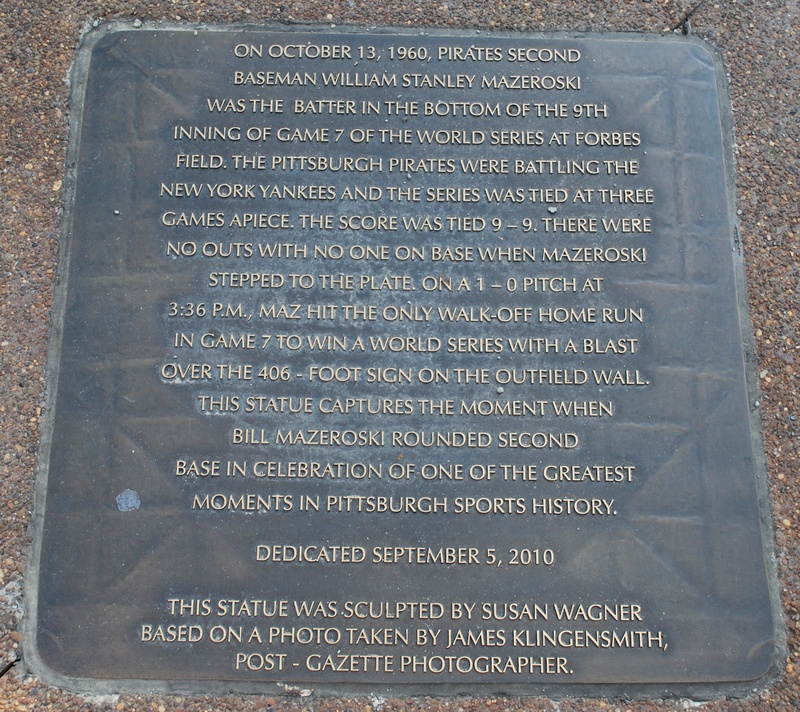 He did so in 1960 to beat the Yankees and a nearby plaque details the statue and the momentous home run. 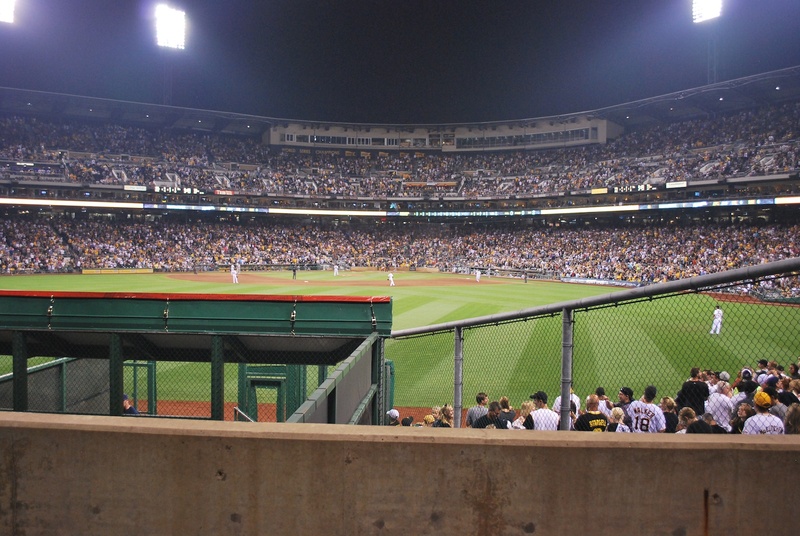 I went inside at 6:00 and took this picture of the back of PNC Park. 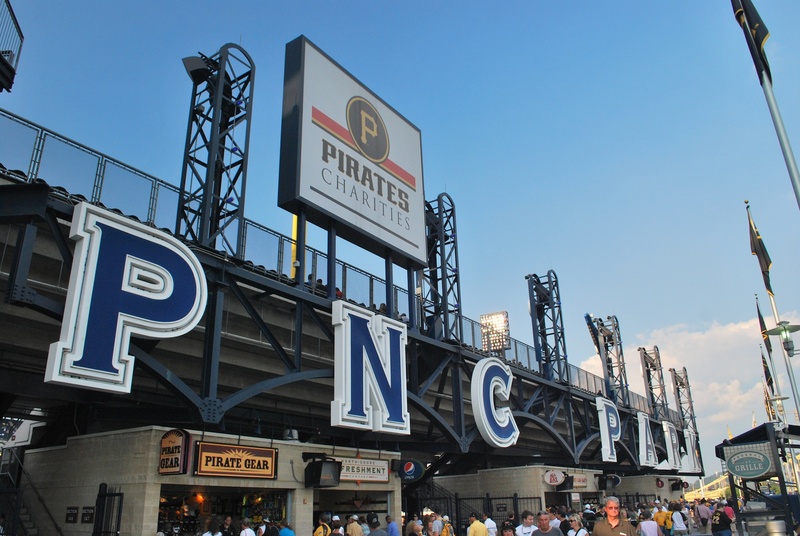 The right field foul pole is barely visible beneath that Pirates Charities sign. 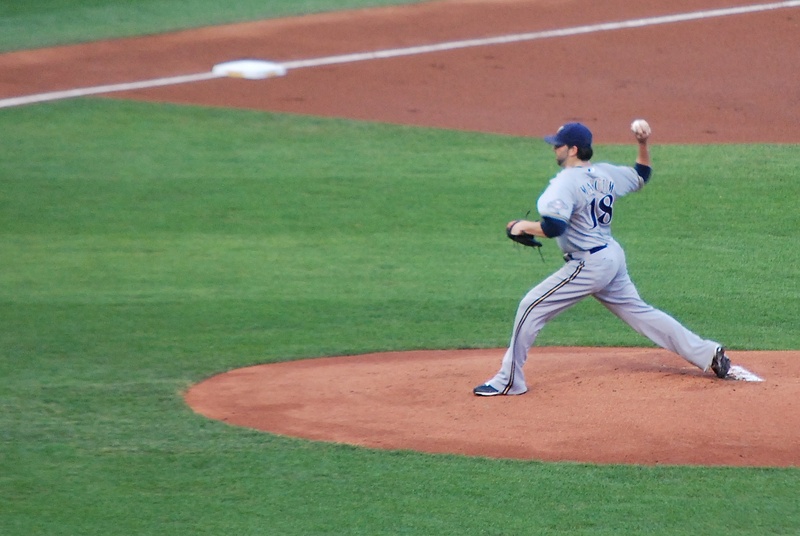 Shaun Marcum was making his first start since being activated from the disabled list. 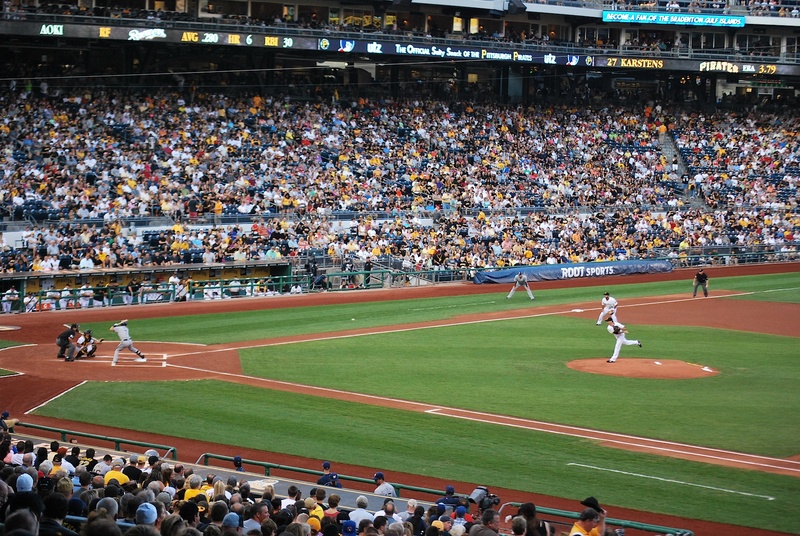 Here he is about to deliver the first pitch of his outing in the bottom of the 1st inning. 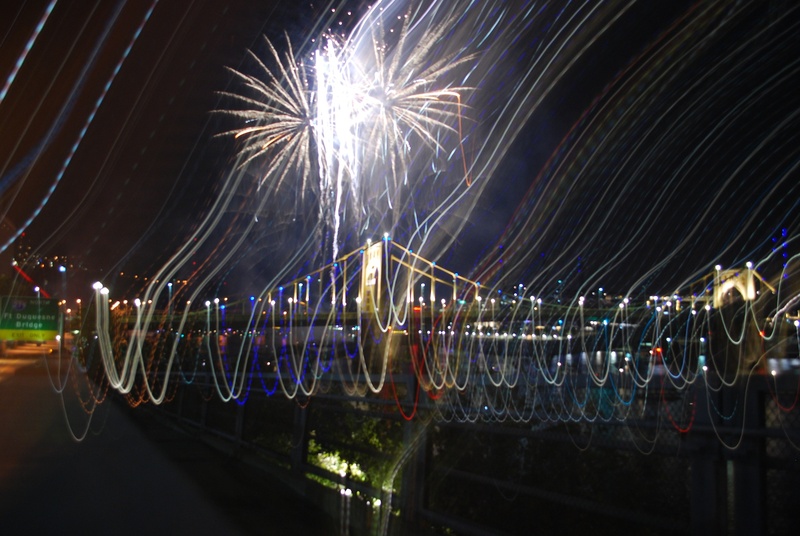 For these shots the shutter was open for about two seconds, thus the need to set it on something. This one is a little better. 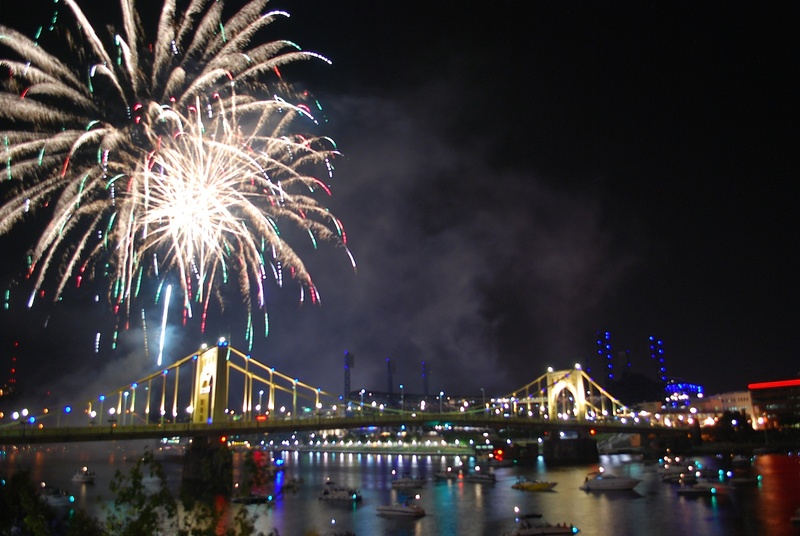 In hindsight I wish I would’ve stayed inside PNC Park and went to the upper deck to get the city in the background. I would’ve gotten home much later and that was the main argument against staying for the show. It’s past 1:45 AM and first pitch is in less than 12 hours. Right after the game I’m driving 8 hours to Chicago in advance of the Monday opener of a 4 game set with the Cubs. Good night.